Ukraine Helicopter Tour | Tour "Ukraine West Helicopter Ring"
Ukraine Tour "Ukraine West Helicopter Ring" is for tourists who love to fly by helicopters and have a limit of time to look at most interesting sights of West Ukraine. 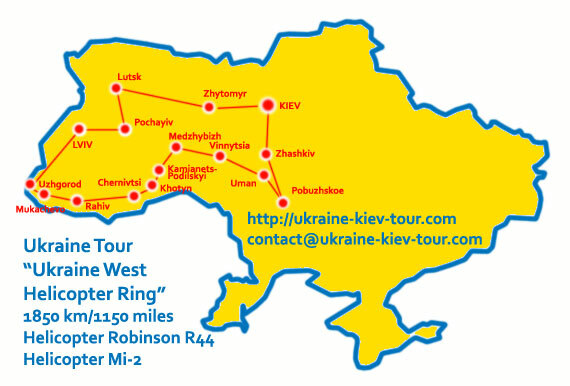 You spend 4 days and 3 nights in high rhythm of flights in a bird's eye view and travel over 1850 km/1150 miles by helicopter Robinson R44 or R66 and enjoy top sights and attractions of Ukraine. 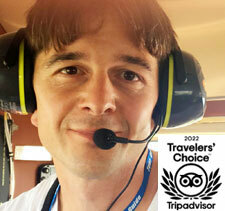 We try the best you have Perfect Travel Memories about your helicopter tour over Ukraine. You are welcome to Ukraine! Fly with us! Transfer by car from hotel in Kiev to Kiev Helipad. Flight from Kiev Helipad to Zhytomyr Airfield by helicopter Robinson R44 or helicopter Mil Mi-2. Transfer by car to Zhytomyr. Sights of Zhytomyr: The Sergey Korolyov Museum of Cosmonautics (one of the most valuable exhibits is a capsule with the lunar soil) and Transfiguration Cathedral. Flight by helicopter close to Nature Monument-Rock "Chatsky Head" (without landing). Flight by helicopter to Klevan. Sights of Klevan: in spring, summer, autumn and winter walking through Romantic Tunnel of Love. Flight by helicopter to Lutsk. Tour of Lutsk: Lubart Castle, Church of Saints Peter and Paul, Lutsk "House with Chimeras" (House of Sculptor Nikolai Golovan). Optional helicopter tour to Shatsk with flight over Shatsk Lakes. Flight to Kremenets (without landing) and then to Holy Dormition Pochayiv Lavra. Visiting of Holy Dormition Pochayiv Lavra. Flight to Pidkamin: Pidkamin Great Stone (without landing). Flight to Pidhirtsi Castle and then to Olesko Castle. Flight to Lviv International Airport. Transfer by car to hotel. For additional fee tickets to Lviv Opera House. Night in hotel. Walking tour of Lviv sights: Market Square, Opera House, Latin Cathedral, Dominican Church, St. George's Cathedral, Armenian Cathedral, Town Arsenal, Kornyakt's House with an Italian courtyard, Assumption Church, Bernardine Monastery, Chapel of Boim, Potocki Palace, Black Kamenica, Powder Tower, Mickiewicz Monument, Pharmacy Museum. Transfer to Lviv International Airport. Flight by helicopter to Karpaty. Visiting Shenborn Castle. Flight to Mukachevo and visiting of romantic Palanok Castle. Flight to Serednie Bodegas with wine tasting at Wine Factory. Flight by helicopter to Uzhgorod. Transfer by car to Uzhgorod. Sight of Uzhgorod: Deca U Notarya Restaurant, Uzhgorod Castle, Holy Cross Cathedral, Church of St. George, Korzo street, Linden (Sakura) alley. Flight to Hust and over Valley of Daffodils in spring time. Flight over Carpathian Mountains to Monument of Geographical Center of Europe near Rahiv. Flight to Chernivtsi Airport. Transfer from airport to hotel in Chernivtsi. Night in hotel. Sights of Chernivzi: Chernivtsi University (Metropolitan Residence), Nicholas Cathedral (Drunk Church), Exaltation Church. Transfer by car to Chernivtsi Airport. Flight by helicopter to Khotyn. Sights of Khotyn: Khotyn Castle and Church of Alexander Nevsky. Flight by helicopter to Kamianets-Podilskyi. Transfer by car to Old City of Kamianets-Podilskyi. Sights of Kamianets-Podilskyi: Kamianets-Podilskyi Castle, Tower of Stefan Batory, Dominican monastery, St. Peter and Paul Cathedral, Town Hall, Polish Gate, Trinitarsky Church. Flight by helicopter to Sutkivtsi and look at Intercession Church-Castle (without landing). Flight to Medzhybizh. Sights in Medzhybizh: Medzhybizh Castle. Flight by helicopter to Vinnytsia. Sights in Vinnytsia: Private collection of weapon of Second World War, flight by helicopter over Wehrwolf (ruins). Unique show of Light and Music Fountain Roshen - Sweat Love Fountain - Europe's largest floating fountain. Flight by helicopter to Uman. Transfer to hotel in Uman. Night in hotel. Flight by helicopter to Museum of Strategic Missile Forces as military heritage of USSR. On the way visiting of Museum of Aviation Pioneer Alexander Mozhaysky in Voronovitsa. Flight by helicopter Robinson R44 to Uman. Transfer by car to Park of Love - Sofiyivka Park. Walking tour in beautiful Sofiyivka Park. Flight by helicopter to Chayka Airlfiled in Kiev and on the way visiting Zhashkiv Stud Farm with horse riding (optional) or Military Museum of Second World War and Soviet Afghanistan War in Shampaniya (optional activity - military vehicles rental). Transfer to hotel. If you want to change the Itinerary of the helicopter tour and visit some more cities of Ukraine or look more sights of Ukraine, please, let us know - we could make your helicopter tour more flexible. 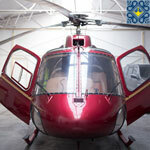 The helicopter tour itinerary could be change during the tour depends on situation and weather conditions.